Michael Reagan, adopted son of Ronald Reagan, has written a very wonderful account of what it was like growing up in the Reagan family. The book offers many interesting anecdotes about the former President that you most likely will not find anywhere else. And as the title suggests, the primary focus of the book is on the life lessons that the author has learned from Ronald Reagan. The narrative flows chronologically for the most part, but since chapters are broken up by topic, there is some hopping around on the timeline of Reagan's life. Each chapter is full of great little nuggets of advice and thoughtful lessons that are presented in a compelling and very readable style. While Michael Reagan doesn't sugarcoat the difficult aspects of the family life or the challenges of living in a blended family (not to mention living in the public eye) he doesn't dwell overmuch on those things; he gives them their due in the story, but moves on to the positives and shares with the reader what he has gleaned from both. There are several references to Ronald Reagan's sense of humor which I really appreciated. One scenario in particular which stood out to me was when Michael is finally able to see his father in the hospital following the assassination attempt in 1981, Mr. Reagan looks at him and says, "Michael, if you're ever shot, make sure you're not wearing a new suit." As one might expect from a book about a US President, there are mentions of politics in general as well as specific policies, but I believe that anyone can enjoy this book regardless of their political leaning. Michael Reagan is firm in his convictions on certain issues, but he writes them in a tasteful and respectful manner. 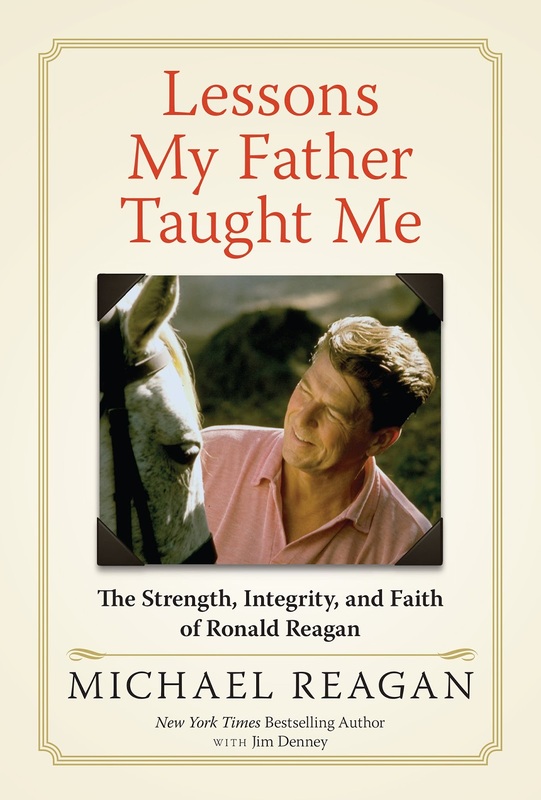 One may disagree with Reagan's (both father and son) stance on an issue while still picking up some great takeaways from this book since the focus is more on the life lessons than the politics themselves. As I was reading this book, I really came to appreciate what a wise man Ronald Reagan was. Many of the anecdotes related in this book illustrate what impeccable character he had and I found myself wishing to emulate the same practices and characteristics in my own life. I thoroughly enjoyed this book and will be re-reading it again soon. I rarely mark in my books, but I actually highlighted and underlined several things throughout the book for future reference. I highly recommend this book to anyone who wishes to learn more about the man; not just the President or Hollywood star, but the man, Ronald Reagan.